A vandal targeted a church on Milwaukee's south side. 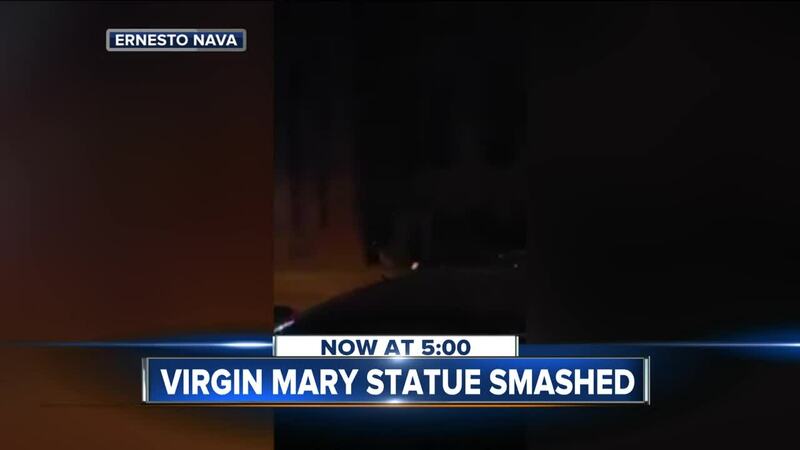 A neighbor captured video of him smashing the Our Lady of Guadalupe statue outside St. Adalbert's Parish Monday night. It was the sound that first got his attention. "It was a crazy noise it was weird," said Ernesto Nava, witness. When Nava got closer he saw a man swinging a metal bar. "It's unbelievable what they do to our Virgin Mary," said Ana Huesca, a parishioner. The church family came together for an outdoor mass where the statue once stood Tuesday. Father Mauricio Fernandez said his congregation took the vandalism personally. "People crying people crying of what happened... This shrine here has been venerated by the whole community. There are many people that before going to work they stop by just in order to say a prayer," said Father Fernandez. Video showed the suspect calling people hypocrites. "Oh my God, this is just hate, that's the only word that comes to your mind and to your heart when you see that," said Father Fernandez. Father Fernandez said he forgives the vandal and is praying for him. He put up a temporary statue, but the church will put up a more permanent one soon. Police said the suspect is in custody.